Hello there friends and crafty Peeps! 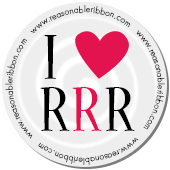 Today is the first so you know what that means......I get to share my first project created with the new Ribbon Club Assortment for June. Isn't this Purple and Pink mix just delightful? It's so happy and cheerful! These bows bring a fabulous pop of color to this card. What's better than one bow? Two of course! 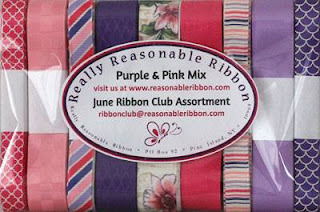 Really Reasonable Ribbon~ June Ribbon Club Assortment, Francis White Crocheted Lace, Scotch Advanced Tape Glider Adhesive. Beautiful card. Thank you for sharing. What a gorgeous card the bg paper is so pretty. The two pink bows really pop and the doily really softens things up.The June assortment is so beautiful I love the various colors, patterns, and textures tfs.